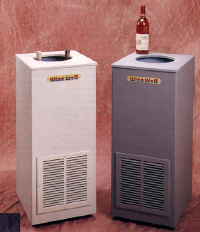 The original Wine Well commercial wine chiller cooling units represent the most economical way a retailer or restaurant can offer cold bottles to their customers. 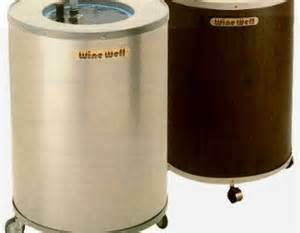 The Wine Well Commercial Wine Chiller in less than 4 minutes without having to use up precious refrigeration space. These units are so compact that they are only slightly larger than its refrigeration unit. They move easily on its own small casters so that water changes (once a month) can be made near a sink or drain. Yet because of its unique tank-within-a-tank design, the cooler retains full-size chill capacity, able to accept up to seven bottles at one time. It uses super cold rapidly circulating water to remove the heat from any carton, container, bottle or can. Now you can have any beverage ready right away. What a convenience!